A tribunal was set up in 1979 after 50 people died when the French-registered Betelgeuse oil tanker caught fire and exploded at the Whiddy Island terminal in Bantry Bay, Co Cork early on the morning of January 8 that year. The final report was completed in July 1980 but files show concerns in government about the press statement that should accompany its publication. 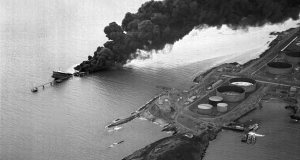 Picture: An aerial view of the Whiddy Island oil tanker Betelgeuse disaster near Bantry in January 1979. A press statement accompanying the report of an investigation did not mention oil companies Total or Gulf. A memo raises the question of whether reference should be made at all to the Total and Gulf oil companies and their responsibility in relation to the disaster. "It is noted that Gulf are now pulling out of Whiddy and negotiations are going on with Greek interests to take it over. If we ‘bash’ Gulf too much, could it jeopardise these negotiations?" The memo also raises the finding that legislation governing the handling of dangerous substances was meant to have been introduced in 1972. "In fairness to Gulf, should we say that the statutory obligations placed on them in regard to safety were inadequate?" Not surprisingly, the statement eventually prepared made no such reference and, in fact, did not even mention Gulf or Total. The tribunal had caused other concerns for the previous government which left office in December 1979 — namely the costs involved. The Department of Finance pointed out that three counsel for the tribunal were seeking briefing fees almost three times the norm and there was also some alarm that the main solicitor was looking for an interim payment of £35,000 after just 20 days sitting. The fees were agreed but when the solicitor, J D Donegan, sought a further interim payment of £47,000 in November 1979, Tánaiste and Minister for Finance George Colley put his foot down and said he would have to wait until the end when all his fees would have to be vouched for. On November 30, 1979, an official contacted a representative of Mr Donegan to pass on the news that "there would be no payment made today" and to ask him to attend a meeting "to iron matters out". The official reported back that Mr Donegan’s reply, through his representative, was: "The answer is no (to the proposed meeting). I will not be in attendance." Even the cost of printing the tribunal report caused grief. Opposition TD Oliver J Flanagan wrote to Taoiseach Charles Haughey in August 1980 complaining that he was being charged £11 for a copy of it. "No member of the Dáil should be charged for a copy of this report as the enquiry was ordered by the Government," he said. One of two replies, signed by Haughey himself, says the Department of Transport had been worried about the cost but that of course all TDs should, and would get a free copy of the report.